After the aches and pains of Thursday, yesterday’s jog through Leigh Woods was very pleasant. While it was hard work in places, it was the right kind of hard work, the kind of hard work that left me standing at the tops of hills panting until I’d recovered, rather than the kind of hard work that had me running along the flat frowning while wondering why my hip was aching so much. 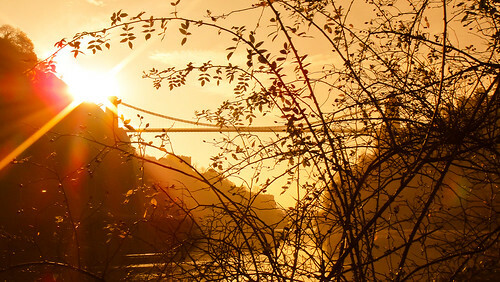 I also got out early enough to snap the sun just rising over the Suspension Bridge. There are limited vantage points with a good view of the bridge from the towpath, so I figured I’d try a different kind of shot, this one through some bare Autumn branches, to try to get something a bit less “same‐y”. I think it worked quite nicely.